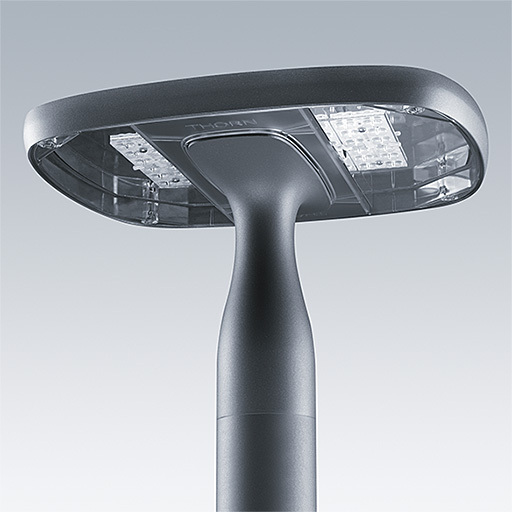 A modern, discreet and versatile post top LED lantern with a symmetric distribution. Electronic, fixed output control gear driving 24 LEDs at 1,05A. Compatible with DALI, 1-10V, RF, Power Line, Minicell, Nema, Presence Detection. Class I electrical, IP66, IK09. Canopy and base: die-cast aluminium (EN AC-46100) powder coated dark grey (close to RAL7043). Enclosure: clear polycarbonate. Equipped with power reduction circuit, effective 3 hours before and 5 hours after a calculated midnight. Complete with 3000K LED. Post top mounting to Ø76mm column, maximum spigot length 75mm. Pre-wired with 5m cable.